The first kilometres of the Maratona dles Dolomites are as electric as any you’ll have on a bike. Helicopters hover overhead, bands line the roadside, crowds cheer and ring cowbells. Epic is a word that’s used far too often in cycling circles, but ascending the Passo Campolongo with more than 9,000 other souls, and with some of the world’s most beautiful roads ahead of you, this is one instance when the use is warranted. To fans of professional racing, the roads here will have an almost religious significance. The race scales seven peaks in total but in particular, Pordoi, Falzarego, Sella and Giau are names that cyclists speak with reverence. These slopes saw grand battles between Fausto Coppi and Gino Bartali, bore witness to the genius of Eddy Merckx and carried the late Marco Pantani to glory. The Dolomites, and the roads that cross them, stand as monuments to the greats of the past and lay in wait as stages for the stars yet to come. They’re at the heart of cycling. They’re also breathtaking. There’s a savage beauty to the peaks and a gentle grandeur to the swathes of green and modest hamlets that lay below. It’s a land of stark contrast, but one also marked by an peculiar harmony – which was, in neat symmetry, the theme behind 2013’s event. Now in its 27th year, the Maratona has grown from a local gathering in Alta Badia to an international celebration of cycling and of these all-too-rare, often fragile places that allow us to pursue our passion surrounded by beauty. The route takes in some of Europe’s most spectacular scenery and the organisation is more akin to what you’d expect at a professional race, which is just as well, because people have come from far and wide. Anything less than perfect, and it would be chaotic. Instead, the whole day runs like clockwork and every need is catered for. You still need to be able to haul yourself and the bike up the mountains, of course, but everything else is looked after. There are three distances available—55km, 106km and 138km—and the event welcomes riders of all shapes and sizes, from ex pros and elite amateurs to those in search of nothing more than the simple pleasure of turning the pedals. Even the shortest route includes a not-insignificant 1,780 meters of climbing and it starts and finishes at the same place as the longer routes, so you won’t miss out on any of the post-race fun. The medium and long options – 3,090 meters and 4,190 meters of climbing respectively—differ in that the full Maratona scales the Giau. Those riders who suffer from pangs of self-doubt will be glad to know that the decision on what route you complete is yours to make on the day, as you’re riding. That’s one of the event’s many admirable traits. It’s incredibly inclusive. Few other races of this scale are as approachable and no matter what you’re like in the saddle, it will be a very rewarding experience. And unlike so many other granfondos, there’s more to it than just lots of bikes. The focus is very much on getting as many people as possible to connect with nature – not a hard thing to do in a landscape that’s so inspiring it’s protected by UNESCO – and to contemplate our relationship with it. It’s the only event of its kind to be certified carbon neutral. The official jerseys even have an extra pocket on the side for your trash. 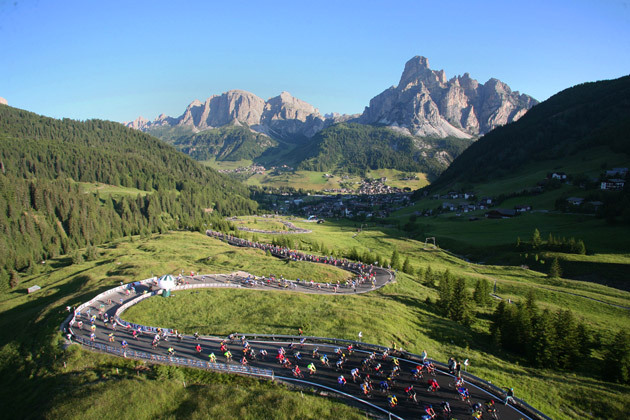 The Maratona isn’t driven by commercial concerns or by a big brand. It’s motivated by nothing more than good intentions and a genuine desire to preserve and promote this special part of the world. The race is only made possible by more than 1,300 volunteers and the benevolence of the entire region. There’s genuine goodwill towards cyclists in these parts, and indeed towards anyone interested the great outdoors and the magical draw of the mountains looming overhead. Nowhere is that more obvious than at the finish line, where onlookers cheer each and every finisher, and an army of volunteers tend to the tired and hungry hordes. Riders gather to gorge on pasta, beer and more than anything, on one another’s stories. The fastest will have finished the long route in under five hours, long before the final few roll across the line in the last of the evening sun. But among friends, gazing up at the summit, soaking up the atmosphere, the clock matters little. Because on days like this, a good time has nothing to do with how fast you ride.